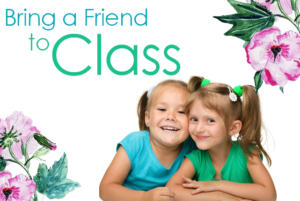 Bring a Friend Week at ABDA! Angela Bates Dance AcademyBring a Friend Week at ABDA! Bring a friend, neighbor or family member to your dance class next week October 1st -6th, 2018. Even if your friend has never danced before, bring them in to check out the studio, our awesome staff, and have a great time! There is no fee for new visitors during Bring A Friend Week. However, they must complete a waiver form (see below). They should wear comfortable clothing that they can move in and wear sneakers with socks. If you have any questions, please contact the studio 610-325-2003. We look forward to meeting your friends!